Well this is interesting. I was randomly searching Google Images for a stock image to use for a Photoshop I was about to perform, searching for “r’lyeh”. When I came across this picture, I was quite shocked. I am the original creator of this image. I made this a year or two ago, right after the O RLY catchphrase took off. Do you happen to know where you found this image? O R’lyeh what does it mean please can you answer on my mail please….. 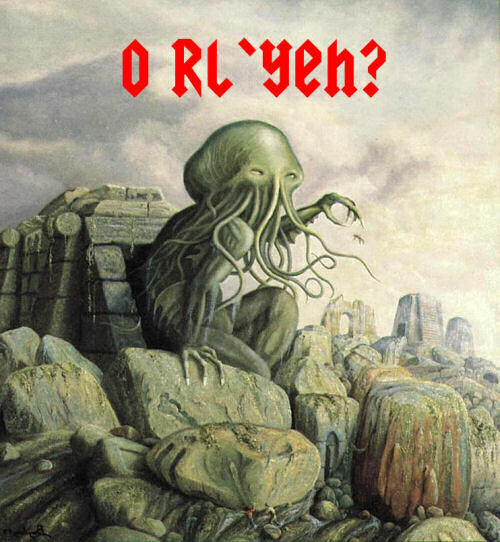 I know about the O rl’yeh catch phrase, but I found a digital copy of that artwork about 7 or 8 years ago. doesn’t hold water. I don’t know who did the original artwork but it wasn’t this D14blo guy. Contention! The interwebs are aflutter! He’s doing the model, lean and look back over the shoulder pose! He is no where as evil as Bill O’Reilly, but has better looks. “That thing” is the Great and Evil Old One, C’thulhu. Bow down to him or DIE. His cult will track you down like a dog and kill you. …I run a CoC game with my friends on Saturdays. I know these things. This is a great piece of fan art to my cult. He looks like one of my followers up in the Chinese mountains. “Ph’nglui mglw’nafh Cthulhu R’lyeh wgah’nagl fhtagn” The writing is most obviously AC/DC font. “In his house at R’lyeh, dead Cthulhu waits dreaming.” Yeh, O’ rly.